Description: P.V.C. Double wall bonded P.V.C. drain system which remains straighter while concrete is being poured. The .100 thousandths thick top cap is half-lapped and runs continuously across fittings and short sections of base to keep straight lines. The snug fit top cap can easily be removed at cleaning time or be replaced when damaged due to ultraviolet sun rays. The inside dimensions, 1-1/2” x 3”, and the longer slots in the top section, allow for ample drainage. Set with string line and nail into 3” stakes through the continuous feet of bottom section. Packaged 80’ per case, 10’ lengths with protective tape on top cap includes 8 couplers and 4 end adapters. Colors: White, Tan, Grey, Black. Concrete deck movement has conclusively proved that no surface deck drain serves well as an expansion joint. 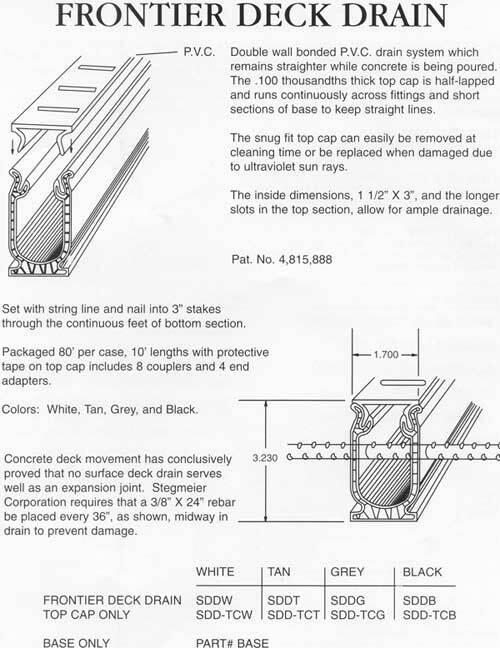 Stegmeier Corporation requires that a 3/8” x 24” rebar be placed every 36”, as show, midway in drain to prevent damage.